Alain Robert has done it again. This Frenchman, nicknamed ‘Spiderman‘ and known for climbing emblematic buildings such as the Khalifa Tower, climbed this Friday on the glass façade of one of the tallest skyscrapers in Barcelona: the Agbar Tower. Without even wearing a harness, the 54-year-old urban climber has climbed and descended the office building, famous for its nighttime lighting. For almost an hour of feat, policemen and some curious who have approached the place have watched the movements of the French ‘spiderman’, who has carried out his mission with a bit of chalk in his hands and climbing shoes in his feet. 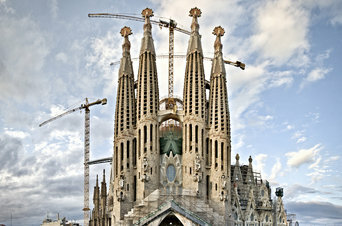 On his arrival to the land, the specialist has been arrested by several Mossos d’Esquadra (catalan police) because, apparently, he was not authorized to climb the building. Throughout his reckless urban climber career, Robert has conquered more than 100 structures around the world, including the Golden Gate Bridge in San Francisco, the Burj Khalifa complex in Dubai, the Eiffel Tower in Paris and the Sydney Opera House; Always without a security team. The Roman wall of Barcelona or rather, what has survived of those protective walls of the colony Iulia Augusta Paterna Barcino Faventia after nearly two millennia of constant urban intervention on them is from a more visible days ago … and until you can touch. This week, most of the locals -and thousands tourists pass even in this early summer autumn it seems Via Laietana- perhaps have not noticed that something has changed in the face of this motley sector Ciutat Vella. The City Council has completed a new phase of a process of recovery and enhancement of the Roman heritage of the city designed and initiated in the mandate of the Mayor Xavier Trias, when the then Councillor for Culture, Jaume Ciurana, insisted that Barcino deserved a plan rescue, hover above the ground in which it was buried and often forgotten. Redeveloping the street Tapineria, between Avenue of the Cathedral and the Plaza del Angel, has eliminated the low walls separating the pedestrian walkway on the walls of a wall that, with this new development and interventions carried out in recent years it remains unrecognizable in many fragments, but those that remain or have been recovered looks a bit more which was begun in the late third century and was modified and rebuilt, with multiple inlaid with noble buildings and modest homes, since then until today. The elimination of low walls and replacement with lower platforms at different levels, connected by a system of stairs and ramps, not only approximate the wall -solving the elevation difference between this and the street, but has also created an interesting space walk, rest and meet in an area of Ciutat Vella very deficient in this regard. The works have now completed-in fact, the recovery of a passageway that was already used in the third century have given continuity to the reform of Ramon Berenguer Square, already in the previous term began to experience urban transformation and applications (with the decision to remove the parking of tourist coaches Via Laietana). The disappearance of the stretch of road that jutted on the sidewalk and the new distribution of landscaped flowerbeds and trees have served at this point to also revalue the wall-in one of its sections imposing- giving it a better view from every corner of the square. In this double action on an area of about 4,000 m2-la Ramon Berenguer Square and the street Tapineria- they have invested 1.6 million euros. Now it would not hurt that, to enhance the whole, the Barcelona City Council signaled with some informative elements this space with so much history and take extreme vigilance in anticipation of incivility, a disease that afflicts many cultural heritage sites and historical value the city has been recovering. The draft recovery of the wall drawn by the previous municipal government raised prolong this archaeological ride newly opened toward the sea from the Plaza del Angel to the square of the Traginers, tracing the wall down the street Sotstinent Navarro (formerly called street Roman walls). A few years ago the demolition of two buildings uncovered a fragment of the defensive walls. Currently they are doing sanitation work in Sotstinent Navarro and archaeological excavations on the wall next to the school Àngel Baixeras claims used as schoolyard empty lot. Although intramural Barcino still might hold new findings, research at this time of the Roman past of Barcelona it is more localized in the works carried out in the Sagrera. The large intermodal station that may someday see the eyes of the locals, no news. Instead, the vestiges of ancient times still coming to the surface as they move the excavations. Earlier this month the work of installing a new network of services casal future of neighborhood building known as Tower Sagrera (street Berenguer de Palou) have uncovered a Roman necropolis of the Republican era (first century BC) of the which until now he had no knowledge. In that space found at least three tombs or burial pits, although the Barcelona Archaeology Service does not rule out that there may be some more. The first of the graves excavated -a 1.70 meters below the current level of the street, under the direction of archeologist Eva Orri, it corresponds to that of a teenager. Barcelona will have from April with one of the most romantic restaurants in the city, especially for those who come to the scene in time to have a drink on the terrace before sitting at the table, in the evening time, as the sun it is hidden in the asphalt. Marea Alta is the name finally chosen for the new facility which will put on the 24th floor of the tower Colon and aims to gain a foothold in the guides of the restaurants with the best views in major cities worldwide. The dining experience, direct Enrique Valentí, will focus on fish, especially grilled. Luxury, intend, will be in the product quality on the success of cooking and the view of 360 degrees in a room of 360 square meters, part of a total area of almost a thousand meters from the bar on the 23rd floor, that Marea Baja, restaurant and kitchens will be called. The average bill will be around 50 euros for those who feel to lunch or dinner and will be less if you opt for a snack at the bar, whose finger-food offer is still emerging. 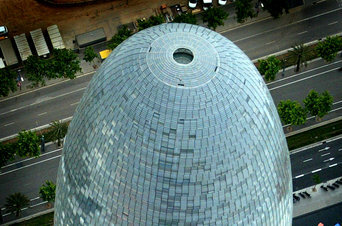 The new facility, which has an investment of about four million euros from various Catalan businessmen, occupy three floors of hexagonal structure found at the top of the tower Colon in Drassanes, an area that crowns a building that is not lost to Barcelona. Built in 1971, with 110 meters high, it was the first to beat the barrier of hundred meters past the Banc de Sabadell, built in 1969, with 83 meters. The building continues to host numerous offices and has as many supporters as detractors. The first praise the slight curvature of the upper part of its structure, it was innovative in the time; the second point with skepticism its higher floors offer the best views of the city, because they are the only ones can´t divide the tower, which was built with the aesthetics of the seventies. One of the elevators, a concierge, lead to the upper floors, where the new facility will be located in what was the headquarters of the shipping company Ibarra, spread over three floors. Diners can travel on floors 23, where the bar, 280 square meters, with terrace will be and the 24, which will house the restaurant. The kitchens, with a spectacular view, be installed on the 25th floor The interior will accommodate the hexagonal glass structure overlooking the city (from distance you can see the Maresme area) and the tables will be distributed glued to the windows. In addition, several telescopes will be installed on the terrace to admire the details of the city from above. Enrique Valenti, who once launched the Dove House and Chez Coco restaurants and continues to lead the successful proposal Bar Bas, on Rambla Catalunya, will head the new restaurant will be dedicated to fish, starring product. “We have sought inspiration as emblematic houses and admired as Elkano and Kaia, Getaria, grills and we want the grill is fundamental. There will be grilled and smoked. But in frying fish, stews and marinades, as well as light appetizers, not subtract prominence to the main course. What is not is a fish restaurant with Asian cuisine. ” Valenti is forming a team that will make up about forty people and for the time already has important signing, that of Julia Duque, who served under Fermi Puig at the Drolma disappeared and who also worked at his side at Chez Coco. The bar area is open not only to customers of the restaurant, but those who want to have a drink or taste the pecking proposal and, above all, enjoy the views. Barcelona has restaurants located in the highest, and the Torre de Alta Mar, the Dos Cielos, the Torres brothers (in the area of 22 @) or Casa Martinez in Montjuïc. The central location of the new restaurant in the Drassanes tower, making it the best vantage point to see the whole city. The Vilafranca Castellers have built a castle in one of the most emblematic of the city of Shanghai locations. The colla of Vilafranca has raised a tower 8 with folre with the Asian city skyline. It is his first appearance since being made castelleres an Asian tour. The other day also raised a castell during his visit to Shanghai Jiaotong University to participate in an act of Barcelona Catalonia Cultural Week, held from 1 to 8 November in Shanghai to mark the tenth anniversary of the Casal Català and the fifteenth of the twinning of the cities of Shanghai and Barcelona. The event was attended Xiquets of Hangzhou. The Castellers Vilafranca continue his Asian tour with more planned actions.